Introducing liquid Omega-3 + Vitamin D for the whole family. One tasty teaspoon a day. 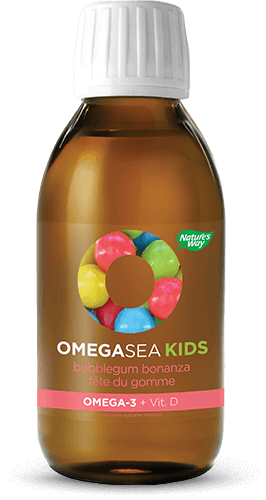 OmegaSea™ is a great-tasting, ultra-pure omega-3 that’s available in chocolate and lemon flavours for families and bubblegum bonanza flavour for kids. With one tasty teaspoon a day, you’ll get a dose of omega-3 and vitamin D that will promote good health, cardiovascular health, brain function, and more. An illustration of a stomach showing a pill passing through to the intestines. OmegaSea contains omega-3 fatty acids that help support cognitive health and supports brain function. With EPA & DHA Omega-3 fatty acids, OmegaSea is a factor in supporting and maintaining cardiovascular health. Formulated with 1,000 IU of vitamin D, OmegaSea assists in bone development and maintenance. The vitamin D in OmegaSea helps in the absorption and use of calcium. OmegaSea contains 750mg of potent EPA and DHA omega-3 that benefit and contribute to overall great health. The vitamin D in OmegaSea helps in the development and maintenance of teeth. What are the advantages of liquid Omega-3? 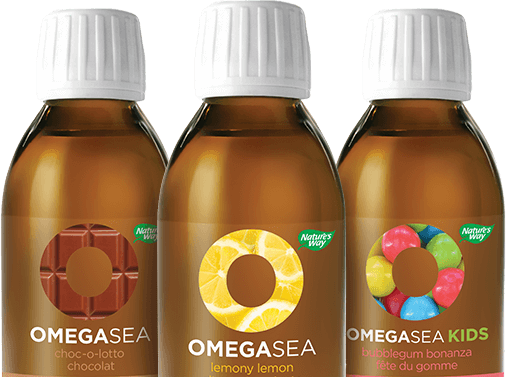 OmegaSea is available in three great-tasting flavours and won’t give you fishy burp back. OmegaSea can be added into smoothies and shakes, making it easier to add to a healthy routine. Children have an easier time consuming liquid omega-3 than capsules. See which formula is right for you. A balanced formula of omega-3 in a delicious lemony flavour. Good for you. Great in shakes! Chocolate flavoured omega-3 formulated to taste good in every teaspoon and in smoothies. Specially formulated for kids in a taste they’ll love. 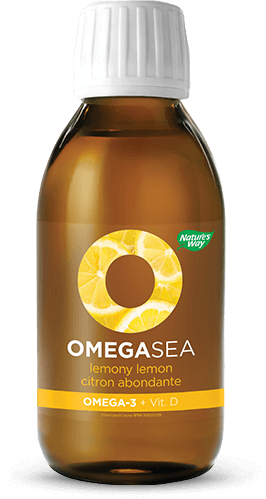 OmegaSea is a great tasting, ultra-pure Omega-3 available in a seriously tasty lemony flavour. With a potency of 750 mg of EPA+DHA per teaspoon, every lot of OmegaSea is third party tested for purity, potency, and label claims through the PureCheck Program. OmegaSea liquid fish oil supplements support good health, cardiovascular health and brain function in adults and also promotes brain, eyes and nerve development for children and adolescents. 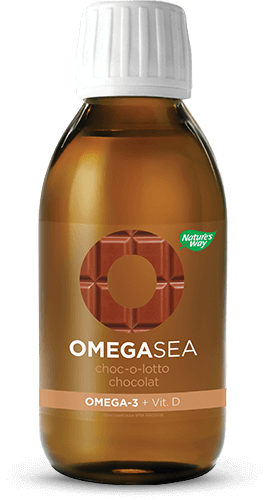 OmegaSea is a great tasting, ultra-pure Omega-3 available in seriously tasty chocolatey flavour. With a potency of 750 mg of EPA+DHA per teaspoon, every lot of OmegaSea is third party tested for purity, potency, and label claims through the PureCheck Program. OmegaSea is a great-tasting, ultra-pure omega-3 available in a seriously tasty bubblegum flavour. With a potency of 500 mg of EPA+DHA per teaspoon, every lot of OmegaSea is third party tested for purity, potency, and label claims through the PureCheck Program. PureCheck guarantees that every bottle of OmegaSea is true to its label claims and is of the highest standards in quality and purity.